NASA has discovered that climate change is playing a major role in reducing the ocean’s floating forests. Giant kelp thrive in cold, shallow waters that are rich in nutrients, growing fast and growing large in record time. Given the right conditions, a stalk can grow 1.6 feet in a single day, according to NASA’s Earth Observatory, and reach up to 200 feet in length. Yet despite these grand dimensions, kelp’s health relies on a tiny “holdfast” less than 24 inches wide. A holdfast serves as a kelp’s root and anchor and, once dislodged, the kelp can die. 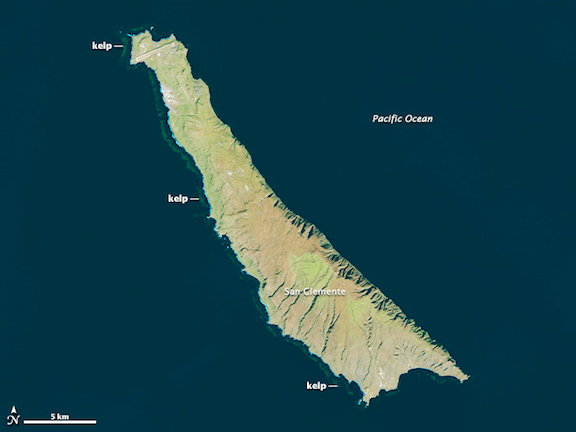 Because the plants can grow so fast, new kelp forests can spring up seemingly overnight. Their leaves and stalks float to the surface buoyed by air-filled pockets known as pneumatocysts and, when they are thick enough, kelp forests can even be viewed from space. This is how NASA noticed a major problem along the Earth’s coasts. Kelp seems to be vanishing everywhere. Nowhere is the shift in the marine ecosystem more visible than in the ocean just east of Tasmania. Along Tasmania’s eastern coast, 95 percent of the kelp has disappeared since the 1940s. It has prompted the Australian government to list its kelp forests as an “endangered ecological community” – a ecological first for the country. The reasons for the precipitous decline in Tasmanian kelp is partially attributable to two of the factors listed above: a shift in ocean temperature and an influx of invasive species. NASA reports that the Tasmanian coast has warmed 2.5°C above its usual subarctic inflow and that overfishing the area’s rock lobsters has allowed sea urchins to multiply beyond control and devour the kelp. To protect the “redwoods of the sea,” as NASA calls them, the agency has urged volunteers to join the Floating Forest project. This crowd-sourced scientific endeavor pulls people from all over the world to classify changes in kelp canopy over the last three decades. 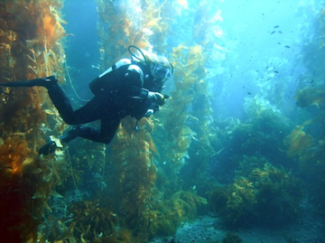 Kelp forests are beloved by SCUBA divers the world over, including Planet Expert Chris Knight. They support marine biodiversity, provide excellent fisheries and have been harvested by Californians since the early 20th century for products such as ice cream and toothpaste. But as oceans continue to warm, the traditional forests along the coasts of Chile, Peru, South Africa, New Zealand and the sub-Antarctic Islands are in danger of dying out. Such a die-off would be devastating for the ocean ecosystem, which is already severely endangered by commercial overfishing.